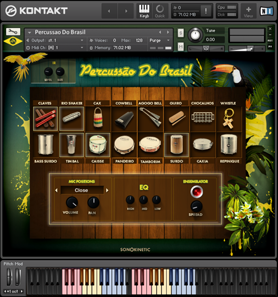 Way back when, when Sonokinetic was in its infant stage, we recorded two carillons and turned them into a simple kontakt instrument. Ever since, we have felt the urge to revisit that, and do it with the knowledge and experience we have gained over the past years. That time has come, and this time it is not just a carillon, but a large collection of different sized bells, from various periods and places of origin. Each hit on these bells will spark a very unique and authentic sound that can only be generated by pure weight and age. Sonokinetic sampled historical valuable bronze cast bells as old as a 1000 years, proceeded through the ages of innovation in bell casting and tuning and ended in our time of hi-tech computer calibrated pitch perfect bells, and sampled all of those with great attention to detail, preserving their original tails of up to 30 seconds. The swiss pocketknife of the collection is the Carillon, sounding just amazing! This is the best pitched and sound callibrated Carillon you will find. Originally cast by the foundries that made the new bell in the Notre Dame in Paris, the Olympic Games 2012 bell and several renowned carillons all over Europe. 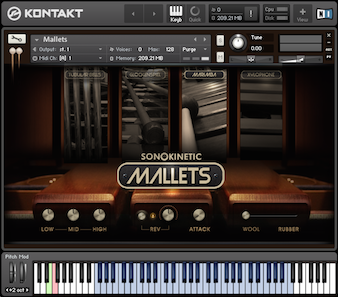 Where Sonokinetic Mallets is there for your subtle orchestral needs, this product will literally blow you away, and make everything sound epic and Majestic, and add a weight to your compositions, pun intended, in a way that not many instruments are able to. 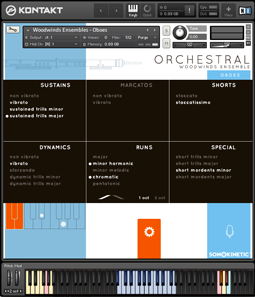 It’s just amazing when you think of it, that you can now have things like this in your composing arsenal, complete church organs, orchestras and clocks weighing thousands of kilos, on a laptop or desktop computer, literally at your fingertips. All samples for this product are recorded and sampled in 24bit 96Khz, and all processing is done in that resolution, after which we converted them to 24 bit 48Khz, making a convenient package of just over 3 GB. 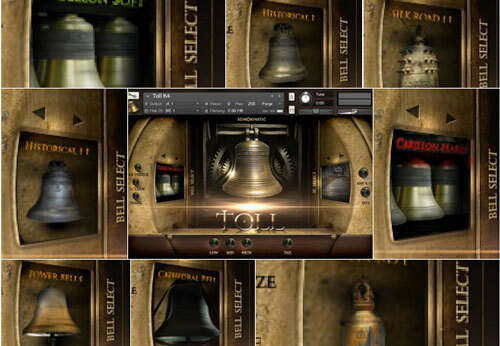 Over a timespan of more than a 1000 years of production, assembly, usage and preservation this very unique collection of bells are sampled here for the fist time and offered to you in an original Sonokinetic library. Sonokinetic climbed a cathedral, risking permanent hearing loss, to capture the original sound of 6000kg heavy cast bells that sound from the Dutch Saint Johns Cathedral and traveled back in time to ancient Dutch Glory of the Golden age in the 16th and 17th century where the production of tower bells was perfected. Toll covers bells from European countries like Belgium, France, Germany and the Netherlands, and an in depth study and recording of South-East-Asian ceremonial bells covering ground from Vietnam to China. We believe in offering very high-quality sample libraries at very attractive pricepoints. Thank you for joining us in making that a reality! 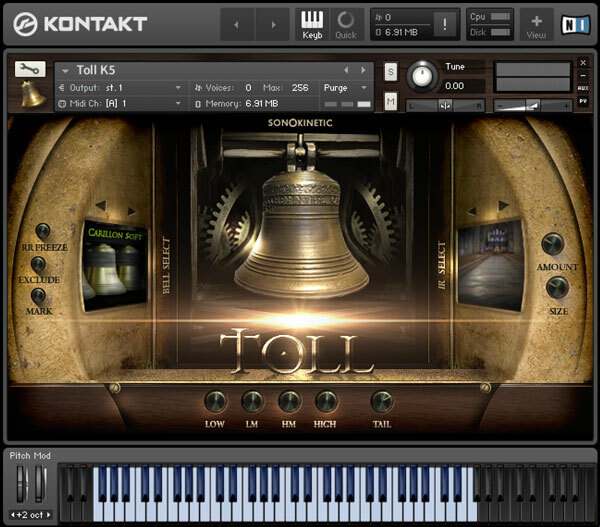 The main UI for Toll consists of several controls: A selection panel to choose a set of bells, tail length, EQ controls and reverb selector dials. There are also buttons to enter the round robin edit menu. The blue keys indicate the playable chromatic range of the Carillion. The blue keys trigger samples. 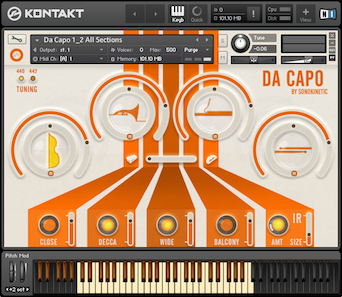 Note that the mapping of some sample sets lie above the +1 range of the Kontakt keyboard, shown above. 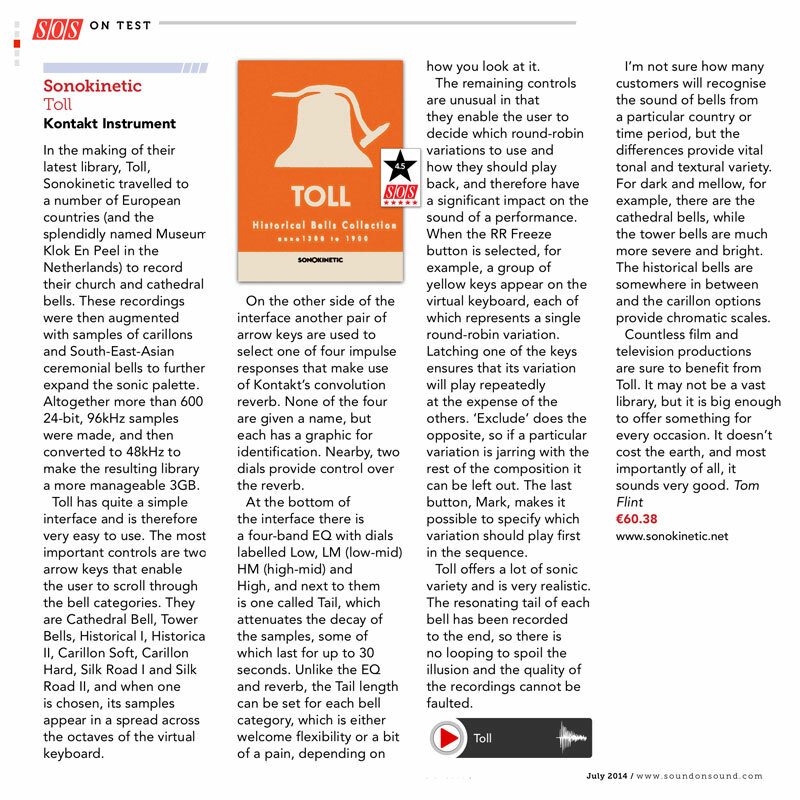 The naturally resonating bell samples in Toll all have very long release tails. The TAIL dial dictates the length of the release envelope when you release a key. Drag the dial to shorten or lengthen the release tail. Holding down a key or using the sustain pedal with allow these release tails to play out at full length. All of the different bell sample sets in Toll have several round robin (RR) samples. These are cycled for each individual key, which produces a very natural sounding playback. 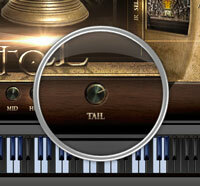 You can see which RR sample is being played by observing the yellow MIDI keys towards the bottom of the keyboard. We have provided three different editing menus for setting individual keys to either FREEZE, EXCLUDE or MARK different RR samples. You may find this useful if you wish your DAW playback to always playback the same samples or if you wish to exclude any unwanted RR samples. Click either the RR FREEZE, EXCLUDE or MARK buttons to enter that edit menu. Choose a RR sample set with the yellow keys towards the bottom of the keyboard. Always remember to exit the edit menu by clicking the FREEZE, EXCLUDE or MARK button again to save your preferred RR changes. When the keys revert back to blue you have returned to playback mode.